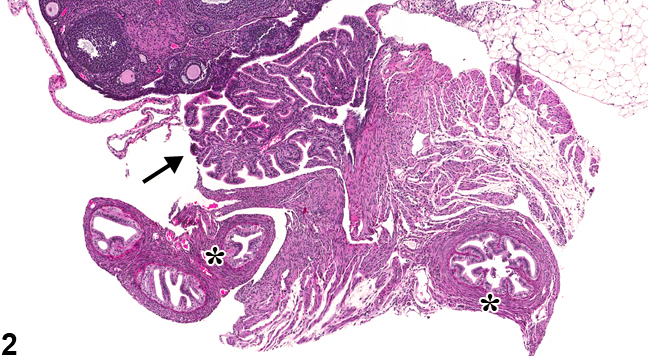 Oviduct - Atrophy in a female B6C3F1/N mouse from a chronic study. 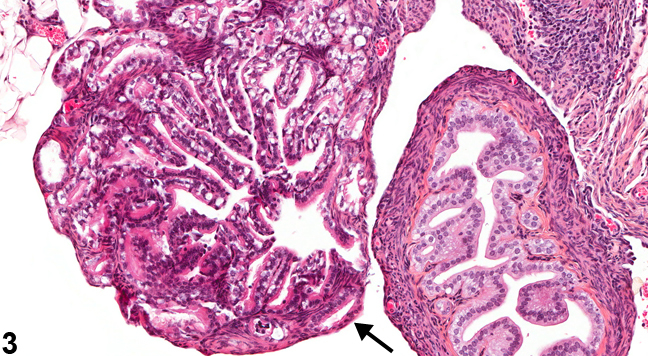 The fimbria in the infundibulum are small and collapsed (arrow) and the folds of epithelium in the isthmus are blunted (asterisk). Oviduct - Normal in a female B6C3F1/N mouse from a subchronic study. 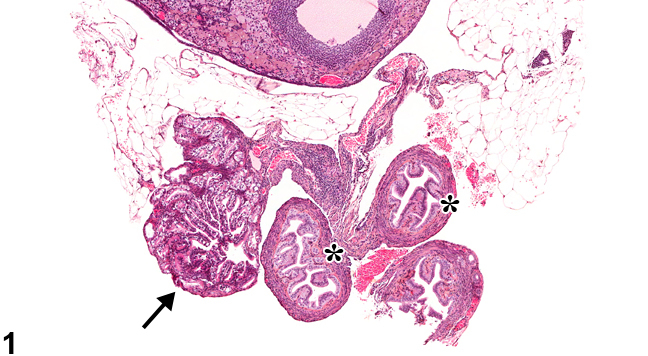 The fimbria in the infundibulum (arrow) and epithelial folds in the isthmus (asterisk) are well formed (compare to Figure 1). 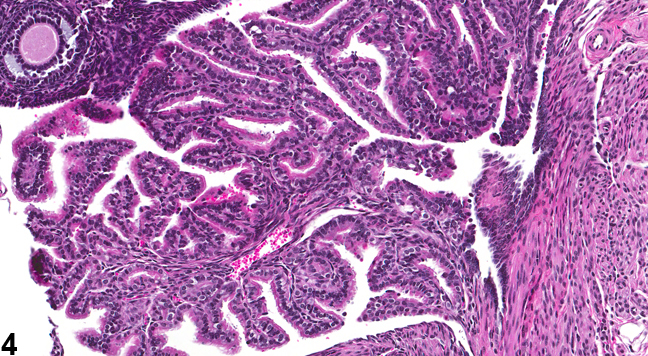 Oviduct - Atrophy in a female B6C3F1/N mouse from a chronic study (higher magnification of Figure 1). The cells in the infundibular fimbria (arrow) are vacuolated. Oviduct - Normal in a female B6C3F1/N mouse from a subchronic study. The cells of the infubdibular fimbria lack vacuoles (compare to Figure 3). Oviduct atrophy is an uncommon lesion and would be expected to occur in association with atrophy of the ovary and uterus or with inflammation. Features of oviduct atrophy include a decrease in the cross-sectional diameter of the oviduct, decreased thickness of the smooth muscle wall, decreased epithelial height, and flattened fimbria and/or mucosal folds ( Figure 1 and Figure 2 ). This lesion must be differentiated from hypoplasia. Oviduct - Atrophy should be diagnosed and graded whenever present.